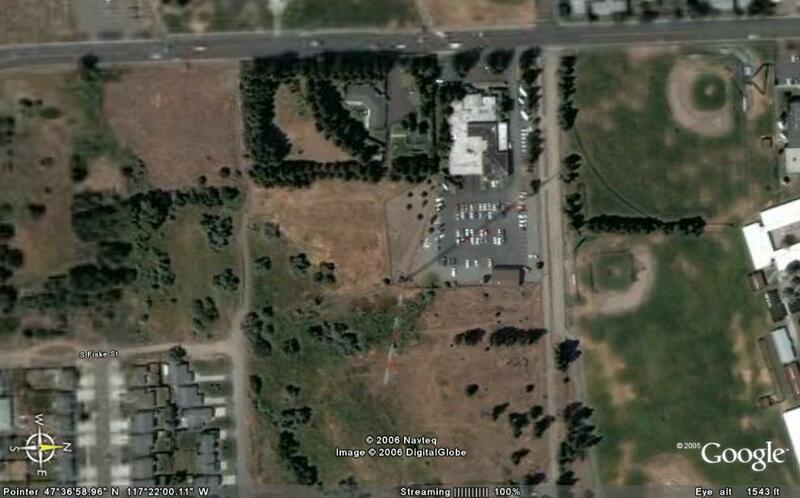 This site is situated on Moran Prairie across South Regal Street from where KHQ was located. KGA on 1510 kHz first used this site from 1942 to 1948. Later, KREM and its successors on 970 kHz used this site from 1950 to present. The shorter of the two towers currently standing on the site is one of the two original towers used by KGA. The taller tower served as a mount for KREM-FM and KREM-TV when they first came on the air. This tower uses a unusual switching system which activates the entire tower for daytime operation and isolates the lower part from the upper part for use in a nighttime directional array. 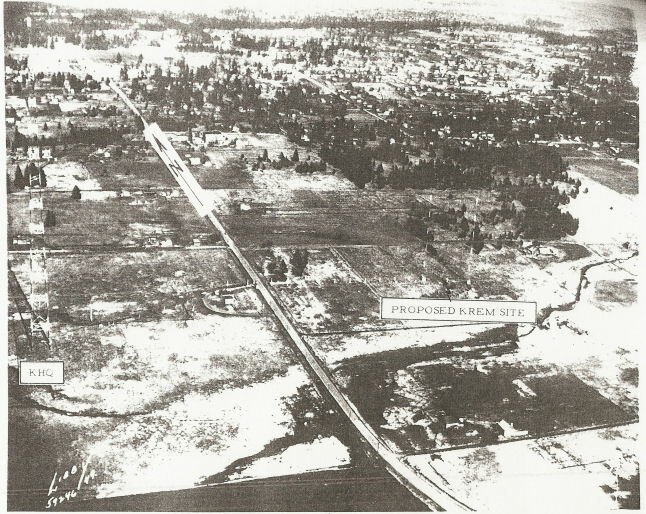 Louis Wasmer moved KGA from the Lidgerwood site on Spokane's Northside to this site after it was discovered that the ground conductivity was better on the Moran Prairie than it was at the Lidgerwood Site. (KGA was the third station to transmit from Moran Prairie, KHQ and KFPY/KXLY being the first two.) The final straw that spurred the move was the pressure that Wasmer was getting from the owners of the nearby Caulkins Air Field. They wanted Wasmer to remove the remaining 225-foot tower because it was deemed a flying hazard. 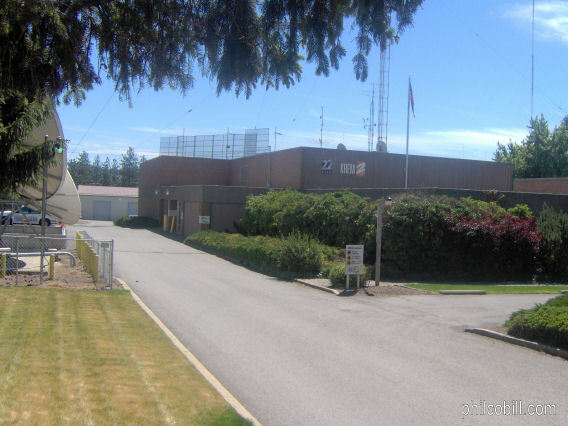 After the perfunctory construction permit testing period, KGA was officially licensed to broadcast on 1510 kHz with 10,000 watts daytime non-directional and 5,000 watts nighttime directional from this site on 15 July 1942. According to Albert Kern, an engineer at KGA, in correspondence to T. Jorgenson in 1981, KGA and KHQ shared the same transmitter building. 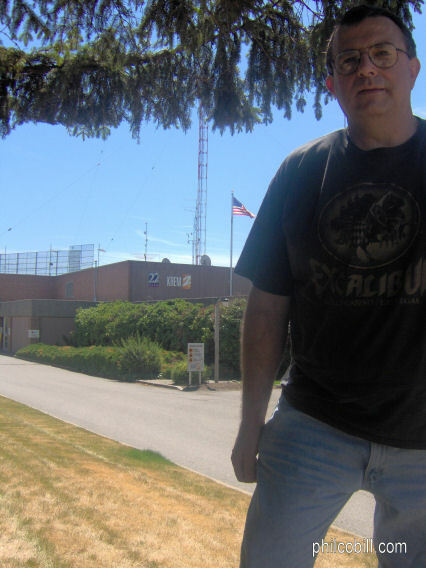 KHQ's tower was on the west side of the street, the same side as the transmitter building. KGA's towers were on the east side of the street, the opposite side of the street from the transmitter building. KGA's transmitter was a 10-kW air-cooled Westinghouse (model unknown) that used 891R tubes to modulate a pair of 892R tubes. The station was directional at night to protect WLAC, Nashville, Tennessee. The two 300-foot tall antennas were fed with a four-line open-wire transmission line that ran from the west side of the transmitter building to the north, then east across Regal Street, and further north to where the KREM (now KTTO) towers are currently located. Kern also related how cleaning the insulators above Regal Street was problematic. By August 1948, KGA had moved to its next home with a 50,000-watt transmitter at 6228 South Regal Street. 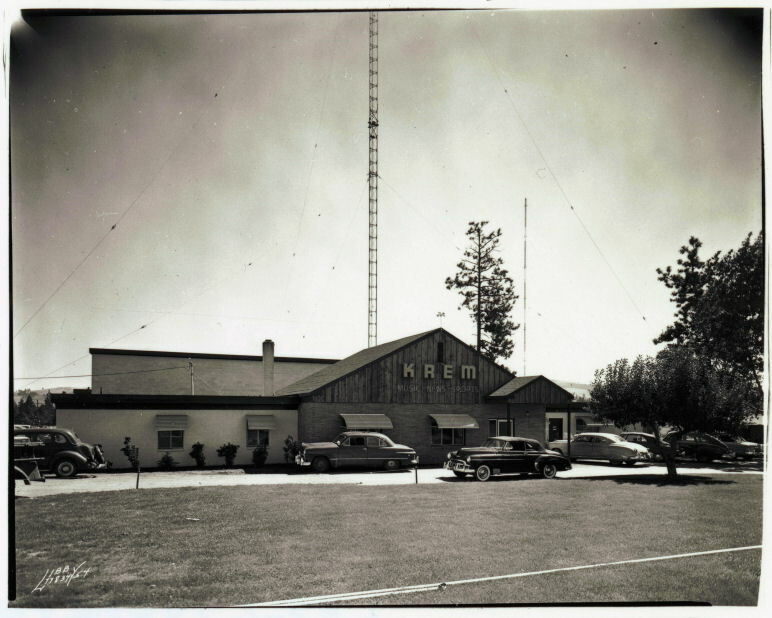 "KREM first used a 1000-watt RCA transmitter at the Moran Prairie site. Some time later, a 5000-watt Collins 21E transmitter was installed. Robert Silliman designed the antenna system. 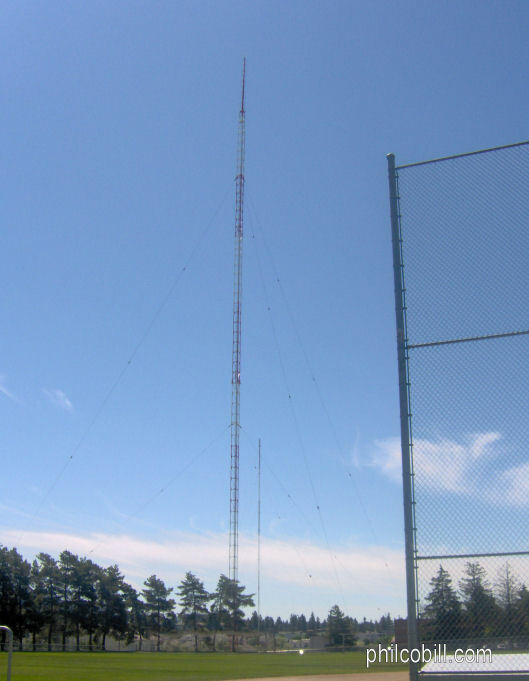 For daytime operation, a sectional 663-foot guyed steel tower was used. For nighttime operation, a second tower, one quarter-wave in height, was built and a switching system which isolated the higher tower at the quarter-wave point was added." According to Antosyn, "a Harris MW-5 5000-watt transmitter replaced the Collins transmitter by 1980, and this transmitter used pulse duration modulation. Originally, the higher tower served as a mount for KREM-FM and KREM-TV before they moved to the 800-foot tall tower on Tower Mountain." The latter configuration as described by Antosyn above is still in use at the site. The taller tower has been called a modified Franklin tower or simply a Franklin tower. In any event, only a handful of towers in the country use a system to switch between two different heights on the same tower. The Harris MW-5 is now used as a back-up transmitter. A Harris Gates 5 is the main transmitter. According to Kern, the shorter of the two towers presently used at the site was one of the original two KGA towers. Field visits to the site by Tom Read of the American Pioneer Broadcasters, www.apb.org when his company operated KTRW and by Ed Antosyn accompanied by this author in August 2008 as well as an examination of the FCC license records by this author confirmed this. 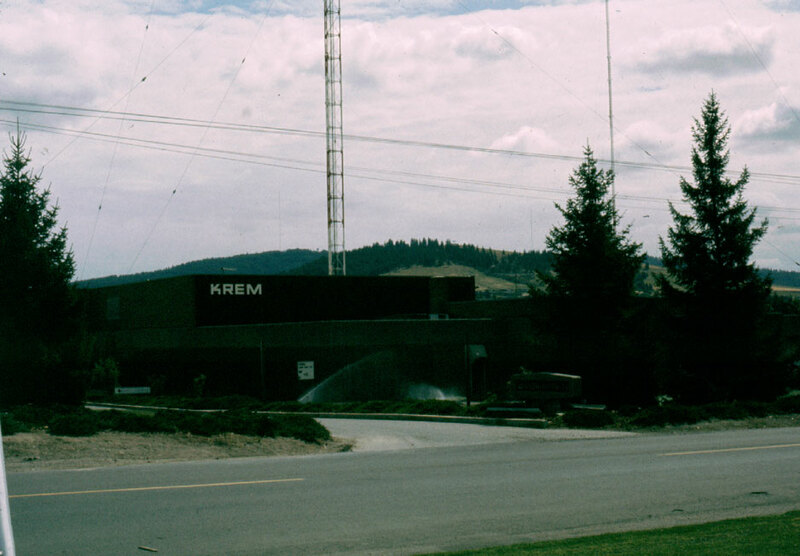 When KREM first transmitted from this site in August 1950 with 1000 watts day and night, it used both of KGA towers. The north tower remained in place, but the south tower was moved to its current location in order to accommodate a directional array. Later, the north KGA tower was taken down when the current taller tower was built. The remains of this tower are still on the ground next to the taller tower. The pedestals for the two original KGA towers are still on the site but not in the original locations. Apparently, someone moved them out of the way. The taller tower, which was originally built as a mount for a television and an FM array that could still be used for AM, is at least 712 feet tall. One reference, possibly a typographical error, says the tower is 752 feet tall. (More research is necessary.) Both the television and the FM antennas are still mounted on the tower, but are not in use. The AM radiator part of the tower is 663 feet tall and is in three sections separated by insulated switching units. The first switching unit is at the 305-foot level. This allows the lowest part of the antenna to be isolated from the higher part to match the other tower on the site, also 305-feet tall, for nighttime directional operation. The full height of the tower could not be properly used with the shorter 305-foot tall tower, so the switching unit was necessary. Another switching unit is located at the 487-foot level. The antenna was very efficient, at 5,000 watts said to be effectively radiating the equivalent of 10,000 watts. Because of this efficiency, the FCC required that the radiation be limited. This was done by shorting the tower across the 305-foot switching unit and placing a 0.0001 microfard capacitor across the 487-foot switching unit. Tom Read offers the following: "When Read Broadcasting acquired KTRW 970, it was being operated daytime with only the first 300 feet of the tall tower. The coverage was not what it should have been. "After extensive technical upgrading, the RF antenna switches at the two levels were repaired and we started operating daytime with the full tall tower which improved the coverage to a point where we were significantly better than KGA 1510 and as good and in some areas better than KXLY 920 at 5,000 watts day. "KREM needed the height for the TV but could not make the night directional work with one 705-foot tower and one 300-foot. I investigated doing just that so we could get rid of all of the switching equipment on the tower but we could not give the necessary protection to the 970 in Portland. "So KREM had devise a way to make a 300-foot tower out of the 705-foot tower for the night directional operation. "I even tried to see if we could change the night from 1000 watts to 250 watts, non directional using only the tall tower but that would still put too much signal toward Portland. "It is interesting that the FCC allowed us to operate with a STA while working on the directional system at night with 250 watts on the tall tower and not one person complained KTRW was interfering with Portland. It makes you wonder that our night AM protection rules are too strict. "While the tall day tower does give 970 better coverage, for the long run, I would remove the top of the tower down to the 300-foot level and it would be much more stable. "Another reason that no one builds a Franklin today is that they are not stable. Everything tends to change with the wind and the temperature." Black, Johnson, and Kendall, Portland, Oregon. 19 January 1942. Letter to the Federal Communication Commission regarding a special authority to operate at new transmitter site. There was a reference to Caulkins Air Field and their complaint that KGA's tower was an air navigation hazard. Kern, Albert. "Early Memories of Radio in Spokane." correspondence to T. Jorgenson 15 February 1981. Spokane, Washington. KGA, Extension of Special Temporary Authorization. Federal Communication Commission, Washington, DC. 24 February 1942. 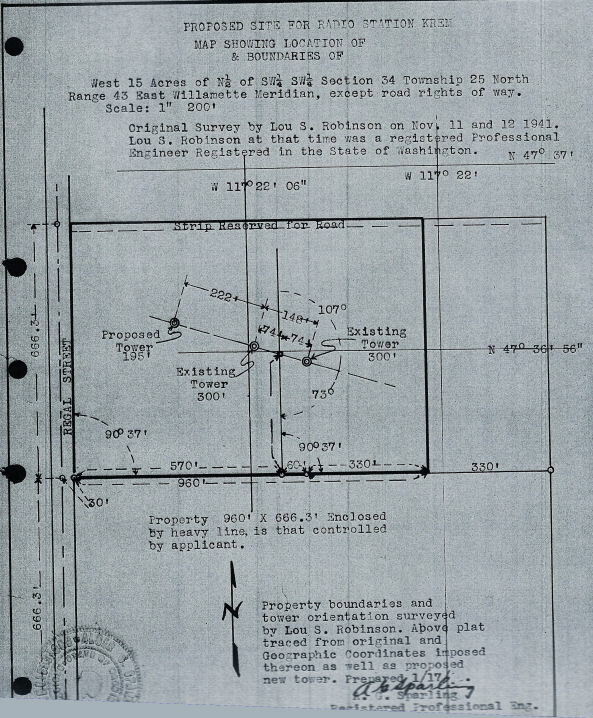 KREM, Regular Broadcast Station Construction Permit. Federal Communications Commission, Washington, DC. 14 April 1950. Smith, Quayle B. of Segal, Smith, and Hennessey. Washington, DC. 1 April 1949. To T. J. Slowie, Secretary, Federal Communications Commission, Washington 25, DC. Letter referencing KFAB's objection to KREM using 1110 kHz. Read, Tom, American Pioneer Broadcasters, www.apb.org. Email correspondence to Bill Harms on 26 May 2007 and 12 September 2008.